Craft presents four emerging maker designers as part of this year’s DENFAIR, Front / Centre – ceramicist Jack Balfour, lighting designer Max Leishman, furniture designers Nanci Ji and Marie Lefebvre will showcase their work across this three day trade fair. Australia’s leading destination for contemporary design for professional designers, architects, interior stylists and design-lovers, Denfair takes place over the 14th -16th of May at the Melbourne Convention Centre. Front / Centre is proudly supported by Schiavello and in partnership with Craft ACT, Craft Vic, Design Object Tasmania, JamFactory and Workshopped together with the Australian Design Centre. Jack Balfour is an emerging potter and designer producing a range of wheel thrown tableware and decorative pieces in porcelain. As he continues studies in industrial design, the pursuit and development of hand skills has been crucial to his work. With a focus on controlled forms accentuated by beautiful surfaces and subtle patterns, each individual object is a joyous celebration of making offering a unique experience. 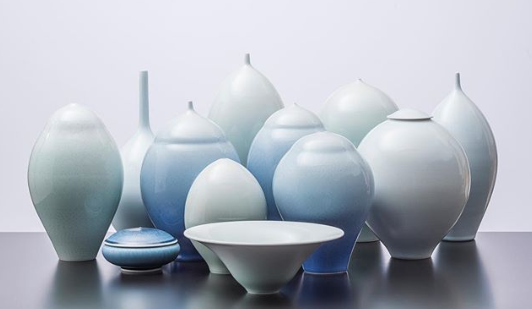 This porcelain collection unites form and function with objects that can be admired for their beauty. Each object is thrown on the potter’s wheel by hand, refined, glazed and fired in Melbourne’s east. Translucent blues and greens reveal the pure white of the porcelain clay. Combined with chun and matt glazes to add variety to the colour palette. With subtle accents of chattered indentations that follow the curvature of the forms, these unique and individual objects hold a sense of presence, celebrating the experience of small batch design and production. Marie Lefebvre is a French designer who has lived in Australia since 2014. She studied Applied Art and Design for seven years in France and Belgium before working as a creative in advertising for twelve years across France, Switzerland, Canada and Australia. She then went on to study Furniture Design at RMIT in 2015. Inspired by the landscape of the region of Kansai, the Nara range is a versatile and modular collection of furniture pieces and objects. The Kvadrat upholstered bases come in two sizes, and can be complemented with a range of tabletops and accessories, including a mirror and a coat stand. The collection has been designed to create peaceful and nature-inspired interiors, and its generous curves and tactile materials give a soft escape from today’s busy and stressful lifestyles. This versatile design allows the user to create customisable configurations to suit both residential and commercial environments. Max Leishman will be graduating this year from RMIT Industrial Design which will coincide with the first product launch of his new lighting collection Scintilla. Max aims to focus on bringing a highly refined sculptural aesthetic to the market within the furniture and lighting design industry. He now currently works at Darkon Lighting as a Junior Lighting Designer whilst pushing Scintilla out into the public. Scintilla is a collection of pendant lights inspired by various futurist space themes. The collection comes as finished modular pieces, which are characterised by a distinctive halo of light. These diamonds are manufactured via an investment casting process out of aluminium allowing for infinite formations and configurations. Nancy Ji is an architect and designer. She is passionate about design across varying scales and media, from objects to environments which enhance our everyday life. Nancy obtained a Master of Architecture from the University of Melbourne in 2014 and has worked for renowned architecture practices in Japan and Melbourne, and now teaches and leads design studios at the University of Melbourne. In 2016 Nancy was the recipient of the Mercedes Benz Design Award, which saw her winning piece, the Lily Tray Table produced by Tait. In 2017, she received the Emerging Designer Award at the Melbourne Fringe Furniture Festival. Archie is a playful and functional table crafted from single slabs of terrazzo. A circular table top and arched legs are cut from standard sized tiles motivated by the goal of utilising the whole sheet of material to minimize waste. Each piece features carefully designed notches that allow quick assembly without any nails or fixings. The table slots together easily and can be flat packed for efficient storage and transportation. Archie is water jet cut and carefully honed by hand on all sides for a smooth finish. The design allows for custom colour combinations by using different coloured tiles together.